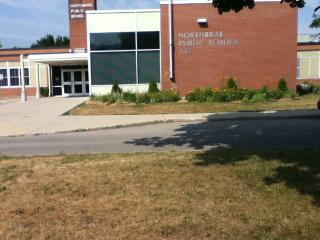 Northbrae Public School is in Northeast London and was built in 1952. Originally, the school was called North Brae but this name was reworked shortly after the county land, where it was built, was annexed by the City of London. The school was built to replace two smaller one and two room schools named St. Lawrence and Merwin Heights. In March of 2001, the school was modernized to include a new office area, computer resource centre, library, washroom, storage and staff rooms. A new coat of hall way paint, stylized tile floors and painted walls throughout has revitalized the building. Pride is a significant word at Northbrae and our community is proud of its heritage. We draw students from a multicultural neighbourhood which has some 34 nationalities represented. Our school colours are purple and gold. Northbrae School offers a wide variety of activities for the students including house leagues, instrumental music and inter-school competition. Finally, our school motto is 'Success Through Effort' and we expect everyone to do their best regardless of the outcome.